Pirates and global warming anyone (aka correlation does not imply causation). OK here’s a challenge then – please plot the graph to show what would have/could have happened if Key had not have been on Letterman. Actually, I should STFU at let Marty and the Gang focus on the trivial and irrelevant which will simply allow National to sleepwalk to victory. Except you’ll note that there actually isn’t a maximum quota on posts per day at The Standard. Focussing on trivial issues doesn’t preclude them from also focussing on important ones. In fact it’s ideal to have both – cater to as wide an audience as possible. Because not everyone takes the time to read every single post on this blog, the article turnover is high enough as it is. But moving on, I must admit, i like how theres just a picture, zoomed, with no analysis, or references given at all. I would say less than half the posts would be trivial. Maybe up around 20% at the most. Depends how recently it was that Zet posted something, mainly. 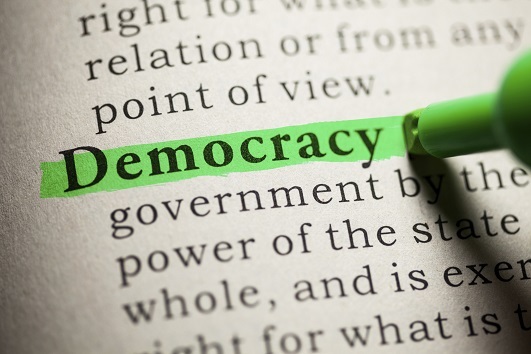 where we dissect an article of faith of the Act party (or teabaggers). Just like Bazar. My personal bet is that they literally don’t understand the other posts and therefore have problems commenting on them. Certainly they are usually not particularly on point when they comment even on those posts. I’m sure that one of the reasons that Zet has an audience. His satire isn’t as good as Danyl’s (in my opinion), but he certainly knows how to rile the real dimwits of the right who pile in with their formulaic aphorisms. Tell that to this government using statistics on public transport to force through more road building and provide less public transport infrastructure in Auckland. First the bxxtards under Douglas x2 and Richardson deliberately eviscerated public transport by privatising it and stripping it for private profit, over 80s and 90s and 10s; then they say noone was using it shown by the stats over those decades. Anything to stop Brown in his public transport supporting ‘tracks’. National gov’t 101. First mislead, then lie if you have to, in order to destroy a chance for all New Zealanders to live the good life. What happened. I clicked on ‘reply’ to Daveski. Could we perhaps have an indication of the general trend in the average American’s disposable income, and exchange rate fluctuations worked into this? Just for arguments sake? Wouldn’t want to jump to any conclusions here. Long ago, when I was at primary school, I learned that for graphs to be representative the vertical scale should begin at zero (unlike here). Otherwise the impression of change or difference gets distorted. We’re only talking about a two-year drop of 700 visitors. A. The post is a pisstake. B. Like a lot of things you learn at primary school, the zero axis rule is just a basic guide that isn’t always right and you should have learned that long ago. You don’t have to start axes at zero. You choose an axis range that fairly shows the range of results that occur to show relative movement. Unless you’re comparing values against zero. You wouldn’t graph changes in the sun’s temperature, for instance, against zero for instance. Okay, okay, rub it in, why don’t you? How about graphs for British or German or Australian or Japanese tourists? I suspect that three of the four follow the same pattern. Chinese tourism may be up in the short term -till the bubble economy there bursts (probably later this year). Tourism is toally screwed due to Peak Oil and the collapse of the world economy whatever Mr Smile says or does. You should start your graph at 0 on the Y axis, Marty, or have a zig-zaggy break line in it. This graph looks very very dramatic, but it’s only a fall of 700 per month over the whole period. I’d like to see the visitor numbers going back to 2000 so we could see if this drop of 700 is exceptional or within the bounds of noise. If we can determine it is exceptional, then we should seek some causes (most obviously the recession). did none of you see the humour label? Missed it first time round. It’s hard to tell with Marty G.
I didn’t. But even if I had, it wouldn’t change my comment. That’s how I roll. I thought this post was a joke. I found it funny myself. Prime Minister John Key is going to sell New Zealand to the worldwide tourism market when he appears on a top US television show next month. Mr Key is booked for the Late Show with David Letterman while he is in New York to speak at the United Nations. He has a guest appearance on the show’s cheeky “Top Ten” slot. “It’s an opportunity to promote New Zealand, it’s gold when it comes to New Zealand from a tourism point of view,” Mr Key said today. 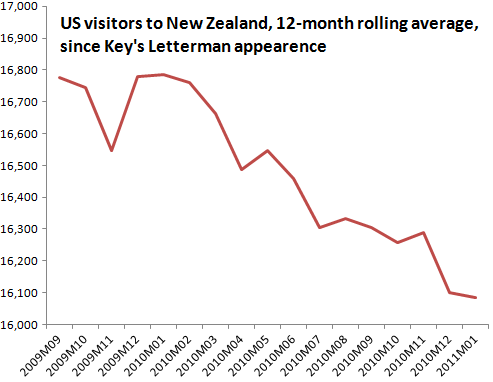 Mr Key holds the tourism portfolio and since the election he has focused on attracting more visitors to New Zealand. If he’d actually gotten an interview, and managed to pull it off without looking like a smarmy smiling chimp (doubtful), then it might have had modest tourism benefits. But a top-10 slot that wasn’t in any way special is forgotten by the next week at the latest. Nice trick with the scale, a 4% decrease over 2 years is nothing to get excited over is it? thanks. do you know you commented in the comments section of the image, where no-one will ever see it? I’ll move it for you. The other nice trick I did was starting the time series where I did. Had I gone further back you would have seen there was actually a massive drop (10-15%) in the couple of months after Key became PM. Due to the global recession, naturally. Actually, the decline in the US market has been 4.2% in the year to Jan 2011. Expenditure from US tourists is down 22%, to $465m, in the year to Dec 2010. (The UK market has taken a bigger hit). I don’t think anyone in the industry is excited by that decline. Given that the Ministry of Tourism has now been folded into MED – and so tourism policy development, research and planning are no longer visibly prominent – it will be interesting to see whether that equates to more or less ‘oomph’ for tourism in the light of these statistics. go your a yawn marty. 800 less, yeah because america isn’t fucked by a recession eh? Be interesting to pull the stats from nz to us. Yeah I’m taking it seriously. Marty, your posts are not funny. You have the humor of a goat. looks like someone got up on the wrong side of bed and found he was out of glasses for his morning whiskey.